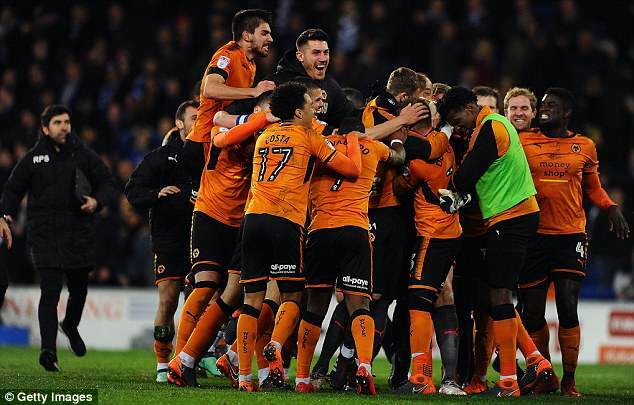 Wolverhampton Wanderers earned promotion to the Premier League before they kicked a ball this weekend after Fulham drew 1-1 at home to Brentford on Saturday. The pressure was on the Cottagers to win in order to maintain mounting pressure on the Midlanders but Nuno Espírito Santo's side head into Sunday's tie with Birmingham in party mode. Wolves hold a 10-point lead over Fulham, who have three games to play, and will now turn their attentions to securing the title after Cardiff kept their fading title ambitions alive with a 2-0 win away to Norwich. Wolves have led by example in the Championship this season despite irking rivals over their relationship with agent Jorge Mendes. Mendes clients' Diogo Jota and Helder Costa have both had big impacts along with Portuguese star Ruben Neves this campaign. It looked like Fulham had done enough after they went ahead through Alexander Mitrovic but Brentford pushed and pushed and levelled in the 94th minute much to the disbelief of the home fans.